Google has created over 49 Million websites for businesses around the world in the form of Google Places. These Google-generated websites contain basic information such as business name and address and a Google location map. They contain Google’s “best guess” about relevant company information and location. However, the latest stats show that only 2% of these websites (Local Places) have been claimed and verified by business owners. Local listings (Google Places) are increasingly valued in Google results. More recently, some local listings appeared ahead of other organic searches on Page 1 of Google results for relevant keyword terms. The resurgence of Google Places is one of the 7 major changes that impacted small business marketing in 2011. 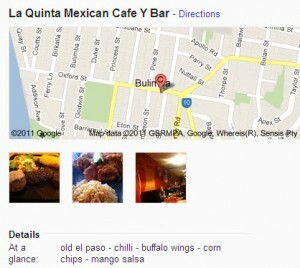 Another key consideration about Google Places is that they are optimized for mobile to facilitate mobile search. There is a considerable fusion between local and mobile marketing occurring now, so creating mobile compatible sites is becoming increasingly important. If you have an offline business, now is the time to claim your Google Places website using the guidelines provided below. The process of creating your Google Places website takes three basic steps, as simple as A, B, C.
If you have not yet created a Google Gmail account, now is the time to do so. If you are working on behalf of a client, then you can create an account with their business name in the email address. Log into the Google account via http://maps.google.com and check if a company listing exists by searching for the company name (with location) in the box provided. If a Google Places listing exists for your business (or that of your client) click the “edit this place” button and proceed to edit. If a listing does not exist, click “My Account” and choose “Google Places” to set up your listing. Google recommends you use the actual business name, not a keyword rich made-up name. This is to assist verification purposes. If Google cannot verify the business and your association with it (or that of your client), you will not be able to edit your Google Places. It is vital that you give the physical address of the business (or if working from home, your home address). The physical address is necessary for Google to employ its Google Map technology as part of your listing. If you do not want the physical address disclosed, there is an option to suppress it later (along with the specific map location). The address is critical because Google Places is designed as a local business locator and Google needs this information to verify the listing. This should be the direct local number so that clients and customers can contact the business directly. The last thing you want to do is send a customer on a “wild goose chase” trying to find someone to talk to on the phone. Google has expressed a preference for you to use the email address that incorporates the company domain, This is preferred to a Gmail account or other derived address, as it aids the verification process. This has to be the URL for your company (not a specific product or service). Google uses this for validation of your listing. If you have no website you can leave this blank. You can make this description keyword-rich, provided you explain to potential customers exactly what the business is about (otherwise you are wasting your listing). Google provides a drop-down list of suggested categories. You can type in the business category you think should cover your business (or that of your client). Google will suggest something close to this, if it does not exist. Unfortunately at the top level, you have to accept one of the Google suggested categories. You then have the option of adding four more customized sub-categories. What you complete here will depend on the nature of your business. Possible information includes hours of opening, service area and payment options. Hours of operation can be critical for some businesses, e.g. there is nothing more frustrating than trying to locate the hours of operation of a retail store when in a hurry. You can upload up to 10 photos provided they are associated with your business or products/services. You can upload up to 5 videos (via their YouTube addresses) that are associated with your business. This is a great opportunity to add multi-media marketing on a page created by Google itself (that it wants to give priority to). Google Places also provides the facility to offer coupons and other special offers. Once you submit your listing to Google, you will be given the option to receive an activation code by phone or by postcard (2 -3 weeks). When you receive this code, you need to use the PIN code provided to activate your Google Places Listing (access via the link provided or via “Dashboard”). If you don’t activate your listing, your (edited) Google Places will not be published. Google Places is an important component of small business marketing and offers the opportunity to have your website listed high in Google search results with an attractive display.